Golden Touch Cleaning LLC has been offering professional kitchen cleaning since 2009 to homeowners who are frustrated with this never-ending chore. Since the "heart of your home" is the major hub of family life, it tends to get dirtier than any other room. With the busy lifestyles we lead and so much happening in one spot, no wonder it’s hard to stay ahead of the curve and keep your kitchen clean. Golden Touch Cleaning LLC wants to relieve you of that messy household chore and have our kitchen cleaners provide you with a spotlessly clean kitchen. Don’t let the dishes pile up any longer! Call us at (678) 534-7314 to learn more about our kitchen cleaning service. Scrubbing and scouring all the kitchen grease and grime is a demanding job. This is a job that Golden Touch Cleaning LLC’s kitchen cleaners are happy to take on. Our standard kitchen cleaning service includes all tasks necessary to provide you with a sparkling clean kitchen. 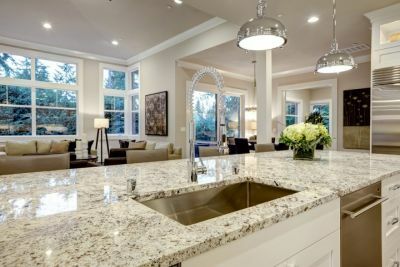 Golden Touch Cleaning LLC excels at cleaning kitchen counters, whether we clean granite countertops, Sandstone counters or tile countertops, they are always disinfected and washed thoroughly to get them grime-free. Golden Touch Cleaning LLC will vacuum and wash kitchen floors till they shine. You can take delight in the way we clean walls and kitchen furniture so you don’t have to! Our kitchen cleaners polish appliances so they look like new. Just imagine the shine! Golden Touch Cleaning LLC clean kitchen sinks and clean kitchen cabinets so that you can come home and look forward to dinner, not more hours of work. Don’t put it off, contact us at (678) 534-7314 to learn how we can help you with cleaning your kitchen.